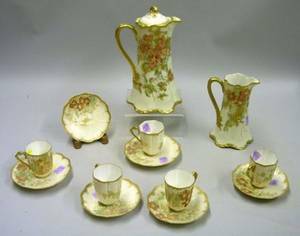 Sixty-seven Haviland Limoges Gilt-edge Porcelain Partial Dinner Set with a Vienna-style Painted Porcelain Creamer and Covered Sugar. Large Haviland Limoges Transfer Decorated Porcelain Footed Punch Bowl and a Chinese Export Porcelain Rose Medallion Bowl. 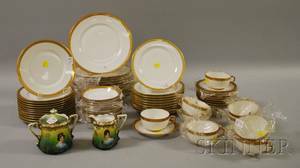 104-piece Haviland Limoges Rumania Pattern Porcelain Partial Dinner Service. 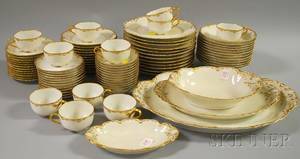 Sixty-five Piece Haviland Limoges Eden Pattern Porcelain Partial Dinner Set. 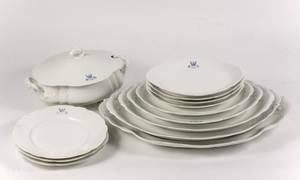 123-piece Haviland Limoges Fontainebleau Pattern Porcelain Dinner Service. 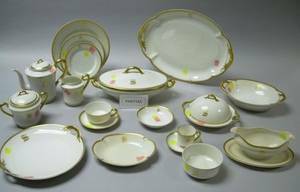 Thirteen-piece Haviland Limoges Hand-painted Porcelain Chocolate Set.